When you stay in a roomy AquaClass® Suite, you'll enjoy the ultimate in spa pampering with Hansgrohe® shower panels, aroma scent selections, a bed pillow menu, daily deliveries of bottled water and teas. Plus priority dining in the Blu specialty restaurant featuring flavorful and healthy "clean cuisine." European-style butler service is available 24/7 for assistance with unpacking, in-suite lunch and dinner service, afternoon tea, evening hors d'oeuvres, complimentary espresso and cappuccino. Veranda with lounge seating and bath with shower/tub combination. Stateroom: 301 sq. ft. Veranda: 79 sq. ft. 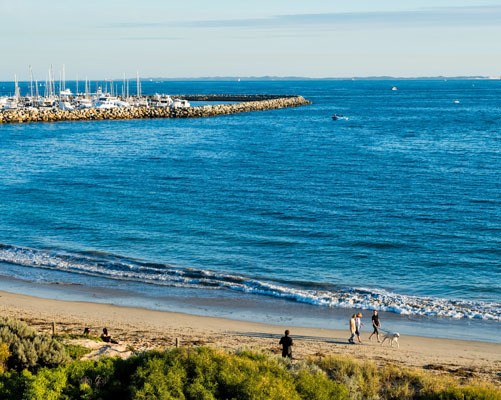 This new category of 130 double-occupancy staterooms, found only on Celebrity Solstice® Class, offers unlimited access to the AquaSpa® relaxation room and Persian Garden. If you love the spa there is no finer way to travel. 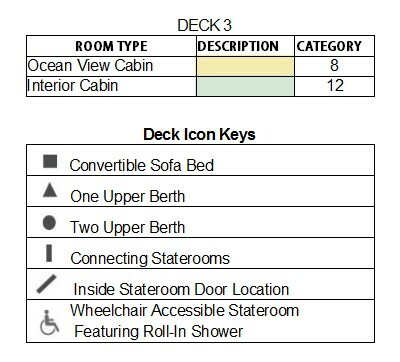 Some staterooms in this category are wheelchair-accessible. Accessible staterooms with a sofa bed accommodate a maximum of three guests. Note: Staterooms 1547, 1549, 1552 and 1554 have partially obstructed views. When you stay in a Celebrity Suite, you'll enjoy the luxury of European-style butler service. This includes assistance with unpacking and packing. In-suite lunch and dinner service. Afternoon tea. Evening hors d'oeuvres and complimentary espresso and cappuccino. Stateroom: 394 sq. ft. Veranda: 105 sq. ft. These veranda staterooms are set in the most desirable locations of the ship and are laid out in the same way as AquaClass® staterooms. Spacious stateroom located throughout the ship with a layout the same as AquaClass®. 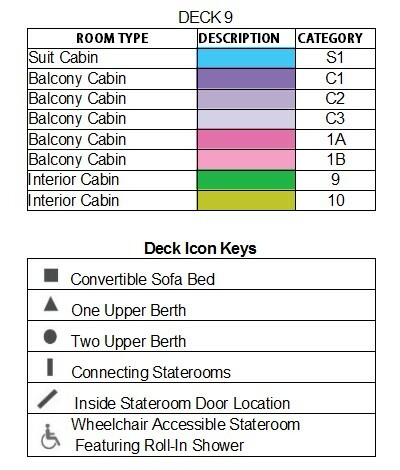 Staterooms: 194 sq. ft. Veranda: 54 sq. ft. 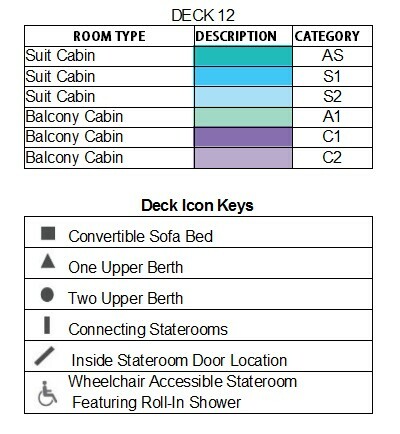 Some staterooms in category 2B are wheelchair-accessible. 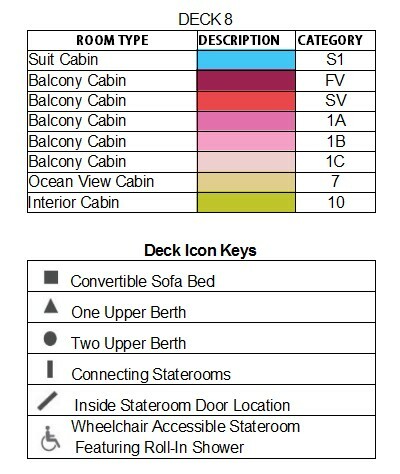 For more information on wheelchair-accessible staterooms. Note: Staterooms with an upper bed and sofa bed that sleeps two accommodate a maximum of four guests. By far the largest Stateroom with a veranda - plenty of room for you and the family. Stateroom : 575 sq. ft. Veranda: 53 - 105 sq. ft. Window staterooms with a sitting area where you can kick back and relax after a day that has been as busy or relaxing as you want it. 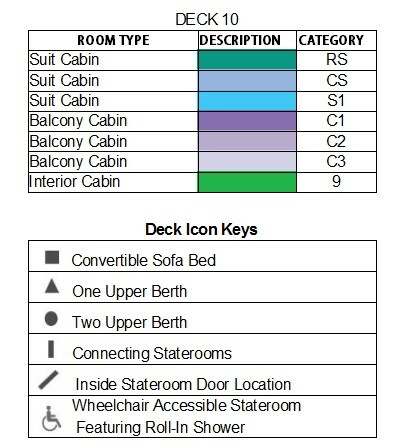 Some staterooms in category 9 & 10 are wheelchair-accessible. Cabins have obstructed view with balcony. When you stay in one of our Penthouse Suites, you'll enjoy the luxury of European-style butler service. This includes assistance with unpacking and packing. In-suite lunch and dinner service. Afternoon tea. Evening hors d'oeuvres and complimentary espresso and cappuccino. We are sure you will be more than happy with the grandeur and scale of the space, along with all the amenities on offer, like the separate living room with dining area, guest bath and luxurious master bedroom. Stateroom: 1291 sq. ft. Veranda: 389 sq. ft. Surround sound entertainment system with 52" LCD TV, wireless connection and full guest bath. Master bedroom features king size bed, 52" LCD TV, vanity, walk in closet, marble master bath with whirlpool tub, shower stall with dual shower heads, double washbasins and 26" LCD TV. 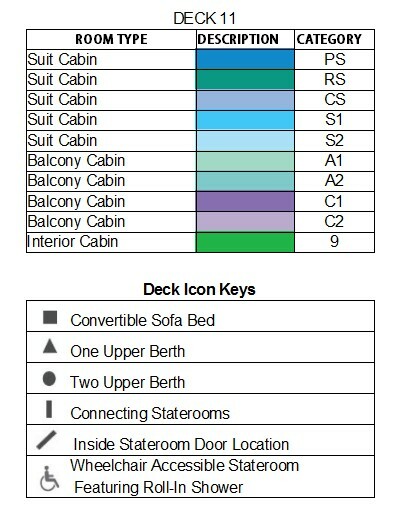 Additionally, suite features veranda with whirlpool and lounge seating. The Reflection Suite-the fleet's first two-bedroom suite with sea-view bathroom-is nestled in the highly-desirable corner location near the new Signature Suites. 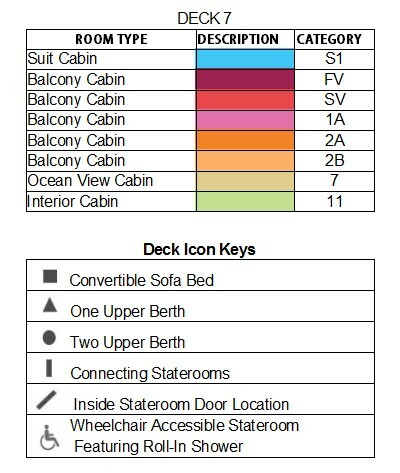 This private section is accessible only to guests carrying a special cardkey. Here you'll sleep on a Premium Reverie® mattress with the ground-breaking Reverie® Dream Sleep SystemTM. An iPad® with the Reverie Remote app acts as a remote control allowing you to easily operate the lights and TV in the stateroom, massage features, and elevation of the mattress. Experience the luxury of European-style butler service 24/7 for assistance with unpacking, in-suite lunch and dinner, afternoon tea, evening hors d'oeuvres plus complimentary espresso and cappuccino. Sea-view bathroom extends out over the edge of the ship, veranda tubs offer a soothing rain shower, expansive veranda has lounge seating. Accommodates six. Stateroom: 1636 sq. ft. Veranda: 194 sq. ft. When you stay in a Royal Suite, you'll enjoy the luxury of European-style butler service. This includes assistance with unpacking and packing. In-suite lunch and dinner service. Afternoon tea. Evening hors d'oeuvres and complimentary espresso and cappuccino.Separate living room and dining area and a Veranda with whirlpool and lounge seating. Stateroom: 590 sq. ft. Veranda: 158 sq. ft.
Veranda with whirlpool and lounge seating. Book a spacious Signature Suite and you'll relax in airy, high-ceiling rooms and sleep on a Premium Reverie® mattress with the ground-breaking Reverie® Dream Sleep SystemTM. An iPad® with Reverie Remote app acts as a remote control allowing you to easily operate the lights and TV in the stateroom, massage features, and elevation of the mattress. You?ll also enjoy the luxury of European-style butler service 24/7 for assistance with unpacking, in-suite lunch and dinner, afternoon tea, evening hors d'oeuvres plus complimentary espresso and cappuccino. Veranda has luxe lounge seating and the bath offers a shower/tub combination. Located in a private area accessible only to Signature Suite and Reflection Suite guests carrying special cardkeys. Accommodates four. Stateroom: 441 sq. ft. Veranda: 118 sq. ft. When you stay in a Sky Suite, you'll enjoy the luxury of European-style butler service. This includes assistance with unpacking and packing. In-suite lunch and dinner service. Afternoon tea. Evening hors d'oeuvres and complimentary espresso and cappuccino.Veranda with lounge seating and bath with shower/tub combination. Stateroom: 300 sq. ft. Veranda: 79 sq. ft. 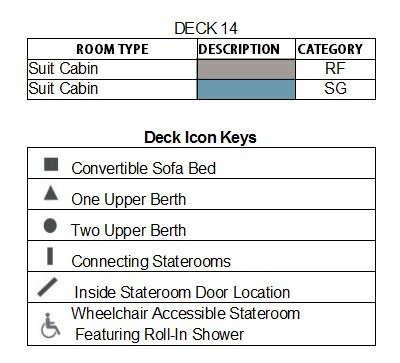 Some staterooms in category S2 are wheelchair-accessible. 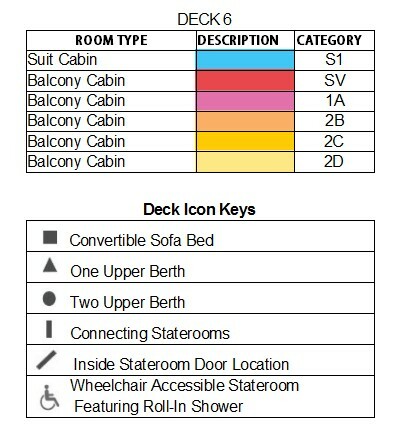 For more information on wheelchair-accessible staterooms. Accessible staterooms with a sofa bed accommodate a maximum of three guests. Staterooms 2130, 2132, 2134 and 2136 have roll-in showers, no bathtubs. providers of health and beauty solutions, we've developed a wealth of transformative treatments that draw on cultures from around the world. You can even purchase the Elemis products used at the spa, so you can continue your new beauty routine at home. Hours may vary according to the ship and itinerary. Please arrive 15 minutes prior to appointment time so that you can focus your mind on relaxation. A Celebrity cruise is an exercise in well-being. Clear your mind during a sunset yoga class or focus on your body during a vigorous workout with one of the certified personal trainers. Be good to your whole self in our state-of-the-art fitness facility with soaring floor-to-ceiling windows. To make the most of your spa experience, Celebrity Cruises recommend that you visit the Persian Garden before or after your treatment. 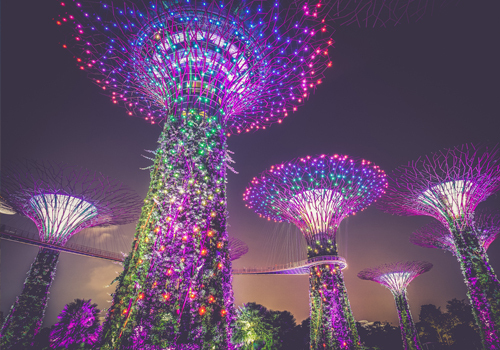 Surrounded by beauty, you will instantly drift away as different grottos release a variety of dry heat, steam and mists into the air with aromatherapy-filled vapors. Relax on a heated ceramic lounger while your body is purified and the pressures of life escape you. Get creative. The Art Studio, a new venue on The Lawn Club, is home to two Master Artists from The ArtCenter/South Florida. They'll host interactive classes and demonstrations such as jewelry making, sketching, painting, and more. This is Celebrity's chic, new approach to the Internet lounge that's also the first Authorized Apple® Reseller at Sea. It's the modern way to connect while onboard. Here, you'll find state-of-the-art workstations featuring MacBook Pros® and iMacs® where you can take a class, check your email, surf the web or print a boarding pass. Certified staff will help you master the latest audio and video products. Learn how to get the most from the hippest tech devices, like the iPhone®, iPad®, iPod Touch®, and MacBook Pro®. And, if you like, you can purchase some of these items on your cruise. Internet access is available in the Internet café 24 hours a day. You will be able to receive email, via satellite link 24 hours a day, satellite conditions permitting. There is also an Internet Manager on board to assist you with questions or to set up an Internet Package at a nominal fee. Immerse yourself in the culture of wine within the inviting atmosphere of Cellar Masters, the wine bar. Cellar Masters offers you the opportunity to try a bold collection of both familiar and unknown wines from around the world. To help you explore these wines, we feature the state-of-the-art Enomatic® wine-by-the-glass dispensing system. With a simple swipe of your SeaPass card, it will pour your choice directly from the bottle in a 1-ounce, 2.5-ounce or 5-ounce portion. The Sommeliers will guide you in the use of the Enomatic® system and offer further insight into the fine art of wine selection, an integral part of an epicurean lifestyle. Then, you'll be ready to begin your travels through the world of wine. An elegant gateway to the restaurants, Ensemble Lounge is the ideal setting for an aperitif en route to an extraordinary specialty dining experience, or a digestif afterward. Live entertainment from world-class musicians and a "dressed for dinner" crowd make this elegant space an integral prequel or sequel to dining. On the totally cool, ice-topped bar, the talented bartenders put on a high-energy show preparing an intriguing menu of classic and contemporary martinis, including the 20-Year Martini in celebration of Celebrity's 20th Anniversary. Sit back in the contemporary plush high-back chairs while listening to up-tempo tunes and enjoy a collection of classic and rare vodkas and a portfolio of fine caviars. Taste the art at this one-of-a-kind bar, serving handcrafted cocktails such as the Berry Patch, Dragonfly and Coming Up Roses, all created by The Liquid Chef, Junior Merino. This is a place to engage the senses and experience the unforgettable art of Molecular Mixology. The musical mood is fresh from lounge to house. Live@Sky - Sky Lounge comes alive with the music, songs and dances of the 40s era with a modern twist. Participate in fabulous swing dances played by the live orchestra and enjoy some classic cocktails sponsored by SKYY® Vodka. Motown - The Sky Lounge is transformed by the funky soul of Motown. Slide into the groove of what makes Motown memorable with music, songs and dances from live band, singers and dancers. Located at Celebrity Reflection's highest point aft, the Sunset Bar provides breathtaking views of the length of the ship and the entire world around you. With its Country Club inspiration and relaxed atmosphere, you'll experience comfort from a point of view you've never before imagined. 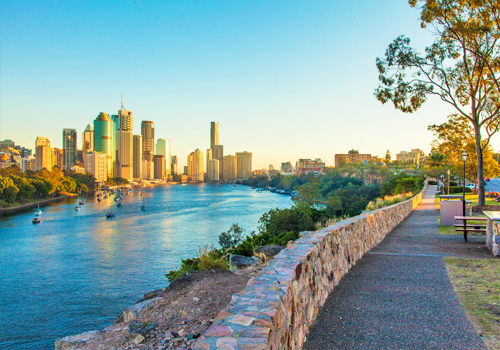 Watch the sun set on the water accompanied by pop and folk tunes from a live guitarist. Enjoy an award-winning Eureka cocktail created by Celebrity's own Bacardi Bartender of the Year. Light up the night with Lady Luck by your side in Celebrity's world-class casinos. With a sophisticated ambiance and captivating sights and sounds, our casinos offer exhilaration for experienced high rollers and those trying their luck for the first time.Celebrity Reflection offers unique combinations of the hottest slots and table games in sophisticated, Vegas-style settings. You're sure to find a game you enjoy. The fun starts here. It's a place designed exclusively for junior cruisers. Activities and program are available 9AM-10PM every day. The Fun Factory is the entertainment center filled with the latest gaming technology and the hottest titles. Junior cruises have the opportunity to participate in exciting games, sports, crafts, music, karaoke, treasure hunts, theme parties, movies and lots more. An assortment of LeapFrog® interactive toys are available for use in the Fun Factory and can also be checked out for private use. ShipmatesSM (Ages 3-5): Activities are based in the Fun Factory. Shipmates must be a minimum of three years old, completely independently toilet-trained and diaper/pull-up free to sign in for Fun Factory programs. Exceptions to this rule cannot be made. Shipmates must be signed in and out of the program by an adult age 18 or over who knows the child's password. CadetsSM (Ages 6-8): Activities are based in the Fun Factory. Check your program for times and locations. CadetsSM must be signed in and out of the program by an adult age 18 or over who knows the child's password. EnsignsSM (Ages 9-11): Activities are based in the Fun Factory, but frequently use other venues and go on scavenger hunts throughout the ship. Check your program for times and locations. Ensigns sign themselves in/out of complimentary programs until 10PM, unless otherwise indicated on their Parental Consent Form. After 10PM, Ensigns require an adult to sign them out of activities. Due to the liberty afforded to Ensigns, please tell your children never to enter someone else's stateroom and to always let someone know where they will be. Toddler time allows parents and toddlers to interact with other children their age. Fun Factory Staff members provide suitable toys for this age group, including LeapFrog® interactive toys. In accordance with USPH policies and standards, Celebrity has provided each ship with lavatory-based changing tables and baby wipes. Children participating in organized events must be fully potty trained; however, you can accompany your child to any organized activity if they're not. 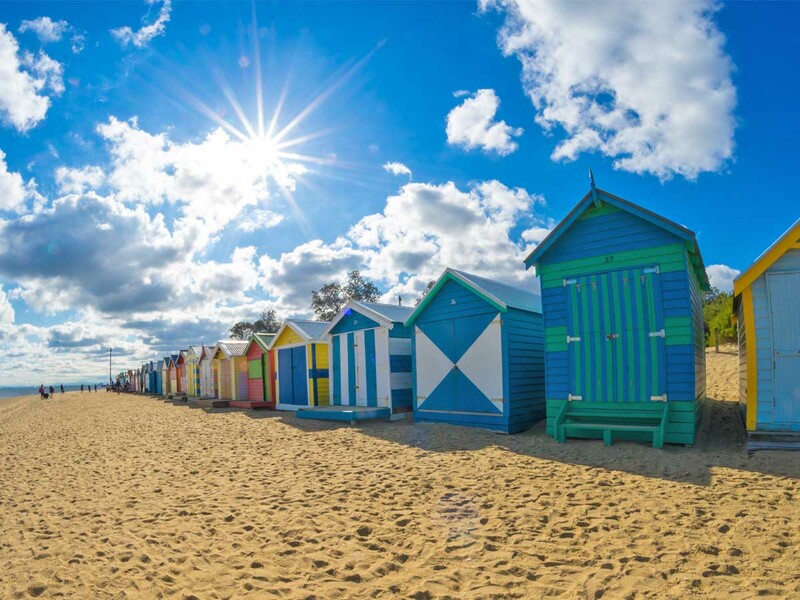 An array of beautiful boutiques offers a great selection of luxury watches, fine jewelry, famous beauty and fragrance products, liquor, and the exclusive Blue Collection—a private label collection of themed apparel, designed exclusively for Celebrity shops. Don't miss the selection of Le Vian® Chocolate diamonds, Tag Heuer watches, Michael Kors accessories, and trunk shows featuring Tanzanite, diamonds, emeralds, Faberge eggs and gemstones. Best of all, shopping onboard is tax-free and duty-free. Cool off in the pool with a thrilling game of volleyball. It's a favorite activity of everyone onboard, even the ship's officers. Taking part in interactive pool games and plenty more. The grand Reflection Theatre is the premier live performance venue aboard Celebrity Reflection. While accommodating a generous audience, it retains a comfortable, intimate atmosphere, bringing you production shows, beautiful musical arrangements, and sidesplitting comedy. You can enjoy high energy, custom productions such as "Pulse", "Remix" and "Edge" along with classic tribute shows rivaling Broadway, West End and Vegas productions. You'll also experience innovative and award-winning European-style circus shows co-produced with international producer Poet Theatricals and unique British-style "Panto" shows created by UK production company, Qdos Entertainment. Also lighting up the main stage are guest entertainers, including aerialists, acrobats, comedians, singers, instrumentalists and magicians. Try your hand at bowling, tennis, boxing, darts, Xbox 360 Kinect® programs and more. Explore different options and take advantage of the fresh, made-to-order delights that await you. There's a wealth of choices, whether you're in the mood for something lighter, or a quick and easy snack. We have something for every palate. Oceanview Café - This café's décor and offerings reflect that of an international marketplace. With a menu influenced by multiple cultures, the cuisine takes diners on a voyage around the world. Stations available in the marketplace include: made-to-order pasta, stir-fry, pizza and sushi, a full salad bar, and a variety of appetizer entrées and desserts. Open for breakfast, lunch, dinner and late night. The AquaSpa Café - Celebrity was one of the first cruise lines to offer a spa restaurant. Celebrity saw an opportunity to create an extension of the industry's leading spa experience by introducing the AquaSpa Café. The result is a creative take on healthy cuisine, featuring an eclectic blend of offerings that are both flavorful and good for you. Pool/Mast Grill - Let your cravings go wild. Grab a great burger in a relaxed, poolside environment. Meet Celebrity Cruises' newest restaurant, available only on Celebrity SilhouetteSM and Celebrity ReflectionSM. The bright and modern Lawn Club Grill celebrates the flavorful joys of outdoor grilling. The highlight of dining at the Lawn Club Grill is the opportunity to serve as your party's "Grill Master," by being paired with a Celebrity chef to assist in preparing the menu for your table over custom-built, ventilated grills. This one of a kind interactive restaurant at sea was inspired by the knowledge that people all over the world enjoy grilling. 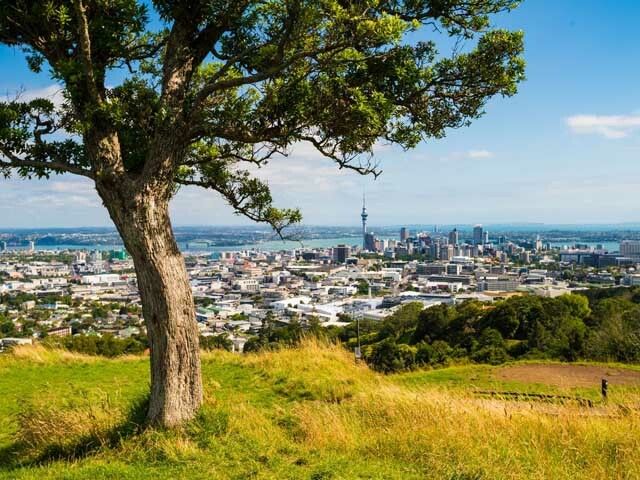 What can be better than experiencing something that's popular among so many cultures around the world, while relaxing near a lawn of growing grass, surrounded by an endless view of the sea? Through one-on-one interaction with our chefs, you will be the Grill Master and experience a firsthand lesson in proper grilling techniques and other tricks of the grilling trade. Choose from a gourmet salad bar, a la carte "build your own" pizzas and more than 12 grilled specialties including USDA Choice Beef, poultry, seafood and vegetables. The Grill Master who wishes to demonstrate his grilling prowess - or learn a few tips - receives a complimentary apron as a memento. The Main Restaurant is the centerpiece of the immersive and enriching range of culinary experiences. 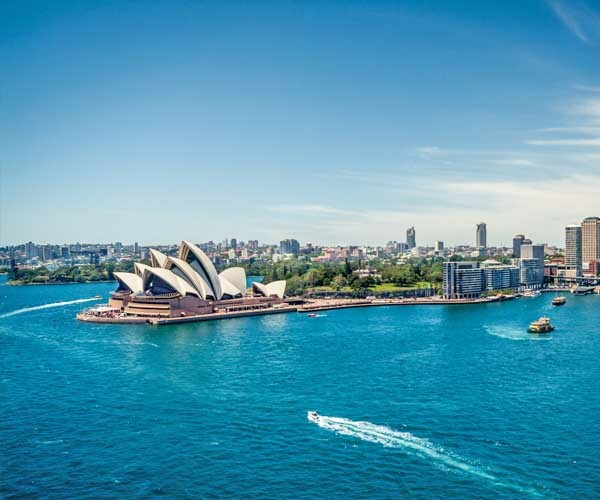 Celebrity Cruises present an unparalleled wealth of choices every evening. Working literally around the clock, the galleys delight in sending out artfully presented dishes, every delicate micro-green garnish perfectly in place. Each meal is a culinary and visual masterpiece designed by James Beard featured Master Chef, Jacques Van Staden, and his team of culinary leaders. The airy and contemporary main restaurant, offers up to 29 exquisite selections, with most changing every night to give you a rich variety of classic and contemporary choices. And the service is legendary.